This book tells the dramatic story of what is still the greatest mines rescue in world history. Knockshinnoch Castle Colliery collapsed on 7 September 1950 trapping 129 miners below ground. 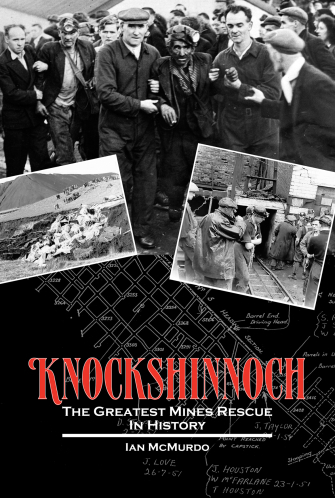 The Knockshinnoch Disaster was to be headline news for days, and the story of the remarkable rescue gripped the world. Over a period of days, 116 miners were rescued by digging from their dark chamber into a disused mine nearby. Tragically, 13 were to perish in the pit. This account tells the miners’ story, using information related by survivors of the disaster, family and friends, as well as those involved in the rescue. Written in ‘diary style’, this book charts the minute-by-minute drama as the deadly gas and tension build up in the West Mine, and the end-game reaches fever-pitch. I was gripped. I couldn’t put it down. I found myself hoping they would be rescued even though I already knew the answer. Time was not on the miners’ or the rescuers’ side. Despite this they succeeded in ‘the greatest mines rescue ever’.